Gordon Harold Andersen was born on the 12th of February 1952. Gordon has said that the sport of woodchopping has given him many proud moments. He has been a proud son watching his father win many cops and then a proud father watching his own sons come through the sport. “There is a great deal of pride” when you see them stand on their log and compete well. Over a career spanning 58 years he has seen a great deal of Australia as he followed the sport he has loved since childhood. He has made many friends and says “friendships in this sport are for a lifetime”. Gordon is a much valued member of our Sport. He is an example of all that is good in a club member and a sportsman. He is one of the first to arrive when there is work to be done, whether getting or trimming logs, setting up at carnivals or any of the many tasks needed for a successful carnival – he also helps with all the cleanup after a carnival. Gordon’s love for the Sport developed at an early age watching his father, Ted, compete. He also “got into” the sport at an early age. As a four year old he was a mascot for the South Easter Axemen’s Association. A representative of Hytest axes was at Mount Gambier Show and wanted him to be photographed with an axe to “show: their axes in action. They provided him with a little Hytest Axe and his father, Ted has an association blazer made for him – so he set to chopping, stopping now and again through the chop for a photo “opportunity”. In 1967 Gordon, aged 15, cut in the South Australian Junior Championship at the Royal Adelaide Show – his first competitive event at a Royal Show. He cut against Mike Fullgrabe, who won the event. Gordon came second – he believes he could have won the event if he had not been so nervous with his mind on the huge crowd and not the wood. 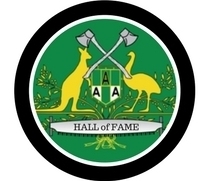 IN 1970, as a 17 year old, he travelled to Tasmania on the boat “Australian Trader” to the World Centenary of Woodchopping as a member of the South Australian Woodchopping Team. Gordon has related that this was a real eye opener to see the world’s best woodchoppers and the huge crowds, 10,000 people to watch, children collect a chip, then go around getting it signed by famous axemen. At 28 years, Gordon was already well into everything his loved sport entailed. There was a New Year’s Day chop at Vansittart in Mt Gambier and Gordon organised the logs for it. He went to Phillips Track in the Otways, felled one tree across the track – out of that he got enough logs to do the whole woodchop there was not one know in any log. All the competitors commented – it was absolutely beautiful wood. As a 30 year old, strong and well versed in the skill and precision necessary achieved through many years of watching and listening to other axemen who were happy to share their knowledge. 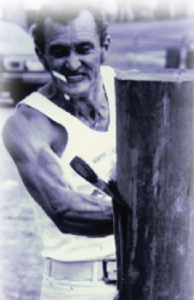 One of these great axemen was Jim Alexander who had a great influence on Gordon – he not only taught Gordon to cut a log correctly, he taught him to believe in himself and also the power of positive thinking. Gordon took on board Jim’f four most important things in woodchopping: Breathing, Relaxation, Confidence and Common sense. And he followed up with the instruction to always stand up straight and fill up with air before an event. Jim excelled in the Underhand, and there was no-one better to teach a young man the art of woodchopping than a big strong man who was a gentle giant and a world champion axeman who loved giving advice and helping others. Gordon has said that it was great thrill for him to have Jim helping him and that Jim inspired him to go home and PRACTICE, PRACTICE, PRACTICE. At Loxton Show on one weekend in October Gordon found out what it was like to be the backmarker in an event. It was a three board tree and Gordon’s handicap was 100 seconds behind so he stood and, anxiously, watched the others who had such a head start on him. When his log came off there was a huge roar and the crowd went crazy. When he looked down the line and saw that he had won, it was a huge thrill for him. One of the highlights of Gordon’s career was not about his own performance he and his father, Ted, went to Brunswick Heads and on the last day Ted won the underhand and the standing block. This gave him the aggregate points for the carnival and one very proud son. Gordon has said that this sport of woodchopping has given him many proud moment. He has been a proud son watching his father win many chops and has then been a proud father watching his own sons come through the sport. “There is a great deal of pride when you see them stand on their log and compete well”. Gordon has a love of his sport which has seen him go “above and beyond” to ensure that this great family sport, with three generation of his family, continues. Gordon now resides in Victoria and has been a member of the Western Australian Axemen’s Association for a number of years. He has continued his dedication to the sport he loves, taking on anything that needs to be done including the “hard stuff”. While Gordon is now in the veteran class, his successes continue and he shows no signs of slowing down. He has had some memorable wins – the much converted “Wills Memorial Standing Block” on three occasions, has hd a number of wins in veteran’s events and still frequently turns up in the placings. Gordon is now passing on his skills to our new and our younger axemen as a coach and assessor for the Western Victorain Axemen’s Association. He has been a committee member for several years and is also an assistant handicapper. Over a career spanning 58 years, he has seen a great deal of Australia as he followed the sport he has loved since childhood. “I’ve been everywhere” doesn’t quite fit but it comes awfully close in taking in: Far North Queensland, the Altherton Tablelands, Brunswick Heads, through Gippsland, Tasmania, Western Victoria, Perth, Jarradale and all over South Australia.